Who's going to take home the trophy this year? Perhaps 56 years of data analyzed with Qlik Sense can give us the answer. 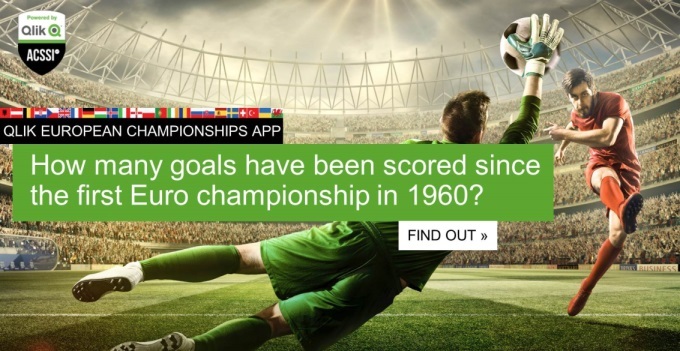 Did you know how many goals have been scored since the first Euro championship in 1960? Check out the app and discover more insights about the biggest sport event of the year! Do you know what record Juan Mata and Zoltán Steiber hold in UEFA club competition? They hold the record for "Time to Score a Goal" in the history of UEFA Championship. Juan Mata scored in the 4th minute, while Zoltán Steiber in the 12. minute a goal as a substitute. You can filter this data on the "Players" folder at the "Minutes to Score a Goal" axis in the "Score Stats" field. Tudja például, hogy az EB-szereplés alapján miben éllovas Juan Mata és Steiber Zoltán? Az EB-k eddigi történetében ők a csúcstartók a játékba állástól a gól szerzésig eltelt idő tekintetében. Beállóként Juan Mata a 4. percben, míg Steiber Zoltán a 12. percben szerzett gólt. Mindez a "Players" fülön a "Score Stats" mezőben a "Minutes to Score a Goal" tengelyen szűrve található.